What I most want to drive home is that the process outlined in The Consciousness Papers and likewise reflected in Select Wisdom is about you connecting with your own greatest wisdom and understanding. In turn, you will have the tools to make the most valuable choices and take the most effective action to get where you most desire. Ever since A Course in Miracles transformed the self-study / self-awareness arena from a niche market into a multi-million dollar industry, people have searched for guides, gimmicks and gurus to help them achieve spiritual transformation. Rob Moore, author of THE CONSCIOUSNESS PAPERSand the companion workbook SELECT WISDOM, spent decades on the search himself, never imagining that one day he would be called to deliver messages to help guide others to the knowledge that was being revealed through him. Following a near-death experience in which Rob left the body and learned that everything beyond this life is going to be fine, he was able to embrace a new perspective on his existence here in the present armed with the knowledge that things were “as they should be.” This escalated his internal desire to reach higher levels of truth, but meant deep changes like ending a long-time dependence on smoking, which he successfully overcame. Less than a month later, Rob perceived his first words from a higher place. As messages came down the pike, it rapidly became apparent that what was happening was beyond anything his brain could possibly produce; entire concepts were delivered to him that were beyond anything he had put conscious study into. He wrote them down and kept coming back to these pages again and again. As days passed into weeks and eventually years, the words became Rob’s reality and, more profoundly, they illustrated levels of reality beyond his ability to cognitively formulate into sentences. 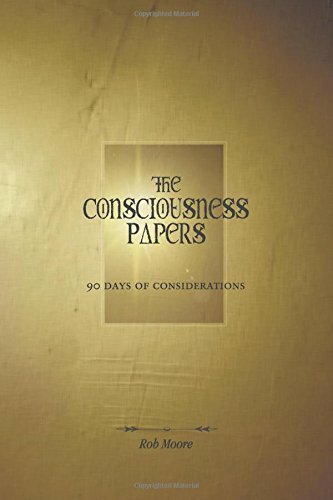 After ruminating on these words for ten years, he felt compelled to publish THE CONSCIOUSNESS PAPERS: 90 Days of Consideration and its companion piece, SELECT WISDOM. Together they represent the organizing of these ideas into a simple, twice a day meditation on ‘being’ that will add up to a more fulfilling, rich and conscious life. For more than a year, while meditating Rob Moore had been visually perceiving that a different level of guidance awaited his arrival. Having already devoted himself to meditation for most of his adult life yet still maintaining a dependence on cigarettes, it was revealed that once he rose beyond that addiction, audible perception with higher guides would follow. Early in 2006, after numerous attempts, Rob at last walked away from smoking and chose the higher level of fulfillment that was clearly within reach. Shortly thereafter, the words you find in these pages began pouring forth. But the task did not end there. Rob would need to live these words over the next ten years and come to not only understand them but to embody these ideas fully. How did The Consciousness Paperscome about? What was the driving force that inspired you to write down what your were receiving? Tell us about your upbringing. How does it figure into your overall journey and to the genesis of this work? You’ve spoken and written about your experience with A Course in Miracles. Explain a bit about that work and how it influenced you. How is this book and your journey similar to that work? How is it different? You spent ten years with this material before developing the book and sharing these ideas. What kind of effect has this material had on you personally? Why did you wait so long to turn it into a book? How did you arrive at the daily format for this course of study? In your introduction you say this book is for everybody but not necessarily for everybody at the same time in humanity’s timeline. What do you mean by that? Who would you say this book is speaking to? What do you think will help readers get the most from these ideas? You also published a companion book to The Consciousness Papers called Select Wisdom. What is the purpose of this book and how do the two work together? How did the format of Select Wisdomimpact your own understanding of the material you were developing for The Consciousness Papers? Do you feel you’re at a point where you have mastered the ideas you present in The Consciousness Papers and Select Wisdom? What can readers expect as a result of committing to the 90 Day study you’ve made available in The Consciousness Papers? You’ve said you don’t consider yourself a guru or a spiritual guide. Why not? And if not, how do you see your role in other people’s spiritual journey? What do you see as next on the horizon for you, your own journey and the words and ideas of The Consciousness Papers? Dalyn Miller Public Relations represents a variety of lifestyle-focused clients and products including experts and authors in the areas of diet, health, fitness, cooking, self-help and more. If this project is not appropriate to you or your demographic, we may have one (or more) that is appropriate.